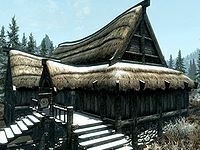 Morthal, second to last building on the left, at the north end of town. 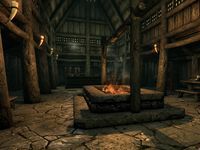 Moorside Inn is the only inn in Morthal. It is owned and run by Jonna, from whom you may rent a room for 10 gold per night. Food can also be purchased and sold here. Lurbuk is the inn's bard, although his performances are not popular. Business seems slow, if not non-existent. One of the few regular visitors is Gorm who comes in every evening for his dinner. Hroggar's burnt-down house is found next to Moorside Inn. There are two separate flights of stairs leading up to the porch on the front of the inn. Behind the inn against the wall are two patches of giant lichen that can be harvested. The common room inside the Moorside Inn. Through the door you enter the main common room of the inn, with the counter at the far end, Jonna can usually be found behind it. There are five long wooden tables and benches all against the walls of the room. Four of the tables hold a couple of loaves of bread and several bottles of wine and alto wine. The table on your right as you enter also holds two salmon steaks, two chicken's eggs and pieces of cheese. In the center of the room is a fire pit. There are several barrels of food found around the room, mainly in the corners. There are three chairs at the northeast end of the room, which is normally where Lurbuk plies his trade, except late at night when he retires to the first room on the left to sleep. There are three doorways leading to three bedrooms, two to the southeast and a larger room to the northwest. There are more pieces of cheese and bottles of wine and alto wine on the counter and under it. Also under the counter are three small coin purses, a steel battleaxe, plenty of bottles of Nord mead, four loose coins and a copy of The Windhelm Letters. Against the northwest wall, either side of the doorway to the larger bedroom are two sets of shelves holding three elves ears, four loaves of bread, seven bottles of Nord mead, six bottles of wine and two bottles of alto wine. Behind the counter are three hanging racks with six pheasants and ten rabbits hanging from them, between them are two garlic braids, an elves ear and a bunch of frost mirriam hanging from a beam. Behind all of this are a row of vats. The first bedroom on the left that Lurbuk generally uses consists of a single owned bed in the eastern corner, next to this is a round table and chair holding a common book and bottle of Black-Briar mead. At the foot of the bed is an unlocked chest and to the left of the doorway is a tall wardrobe containing clothes. The second bedroom consists of a single unowned bed in the southern corner, a round wooden table and chair next to it and a dresser against the southwest wall holding four common books and inside a basket is a copy of the Restoration skill book Racial Phylogeny. The larger bedroom consists of a large double bed in the middle of the northwest wall with dressers either side holding a bottle of wine, a bottle of alto wine, two bottles of Nord mead, a steel dagger and six common books. On the floor, beside the dresser on the right is a large coin purse. Along the northeast wall are a pile of food sacks and a long unlocked chest. To the right of the doorway is a wooden table and chair holding a bowl and goblet. This is the room you will be given if you decide to pay to stay the night. This page was last modified on 24 March 2017, at 05:35.